Darkside Lacquers in Murder of Crows- This is a gorgeous dark cranberry color. It's one of my favorite shades (you should see my hair) and the polish if 5-free and vegan. It's got a bit of glitter to it, too. 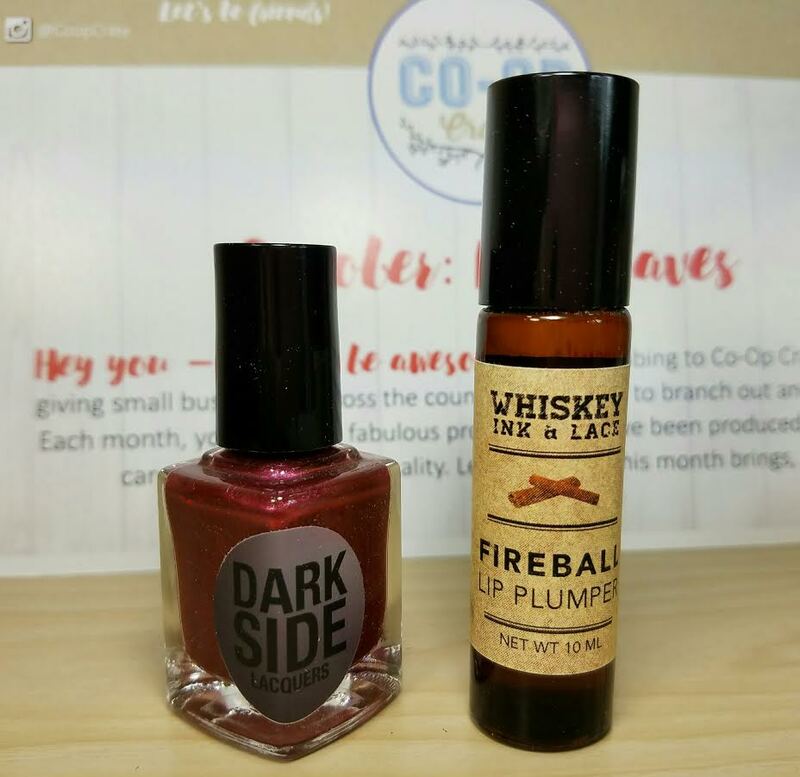 Whiskey Ink and Lace Fireball Lip Plumper- This is a plumper using coconut oil as a base for the cinnamon oil plumper. I have to admit it stings but that's probably where the plumping comes in. Either way, it tastes amazing! I freely acknowledge that I applied it more than once just so I could lick it off. Is that wrong? 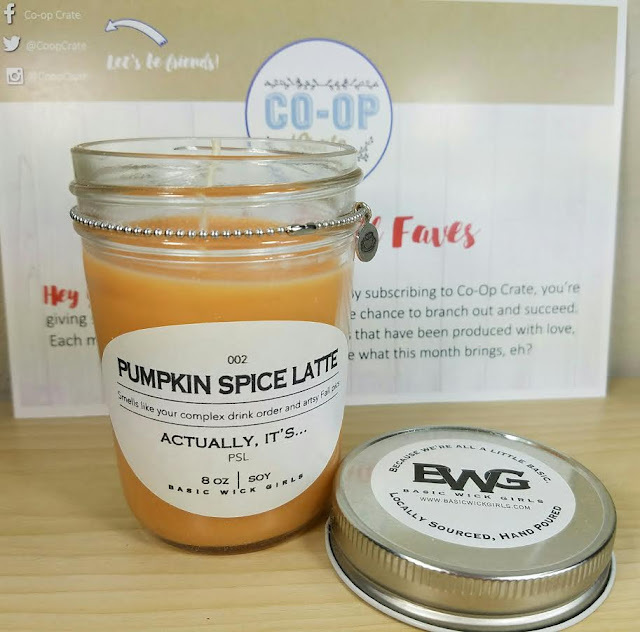 Basic Wick Girls Pumpkin Spice Latte Candle- *swoon* I don't know about you but there's something about Fall that just makes my life more enjoyable. I'm pretty sure it has to do with all the scents associated with it and this candle is the icing on the cake of my life. I'm pretty sure I drooled while smelling this. It's made of soy and has a 25+ burn time. Harvest and Soul Shaving Bar in Pumpkin Spice- I've been branching out in my shaving by using a safety razor and shaving bars. So has my husband. I keep all the good scents for myself, though, so this one will be miiiine! This is even easier because you just rub it on your skin til the lather gets going then do your thing. It also has a bit of glitter in it but I don't think that will make too much of a difference since everything gets washed off anyway. 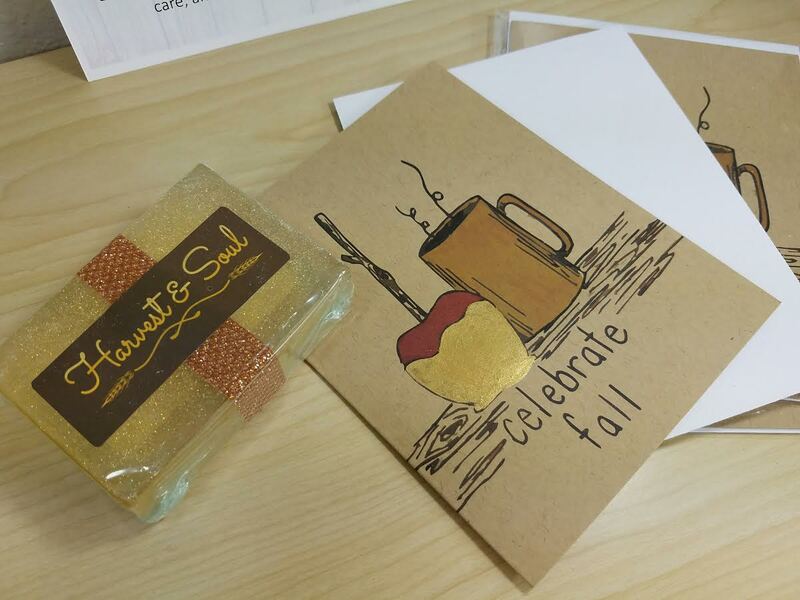 Everday Summit Fall Greeting Card- These cards are so perfect for Fall. I've got a couple of birthdays in the family and I think I'll send these instead just for fun. My grandma turns 90 on November 10th. I think she'd appreciate this. Gold paint is always a bonus. Akron House Co. Apple Jack Tea- Could the curator of Co-Op Crate be any more amazing? Apparently the answer is "Yes!" because with each item I get more obsessed. I love tea! This tea smells fabulous and I can put it in my new mug that I snagged on our trip overseas. 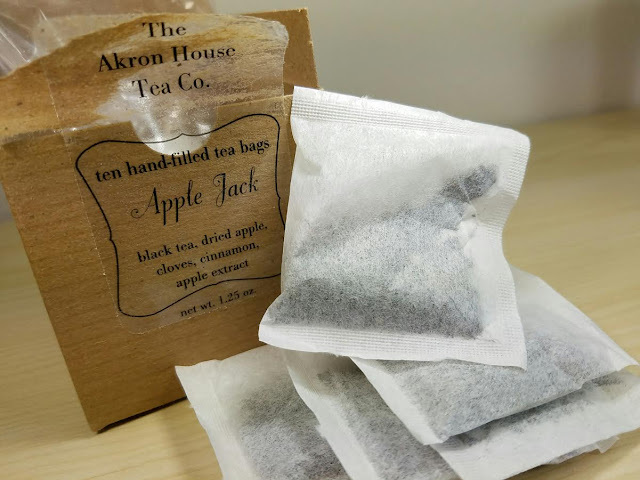 This tea is made using black tea with apples, cinnamon and spice. 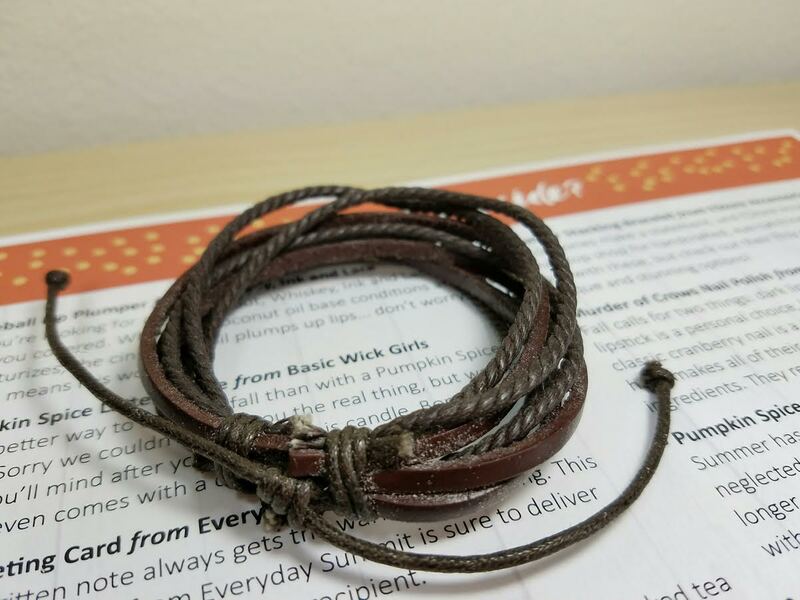 EStore Accessories Leather Bracelet- Etsy has become synonomous with handmade and I peruse the shops regularly. This bracelet is made of leather and is adjustable for pretty much any wrist size. That makes it a perfect addition to this box. Plus I can use it as part of my steampunk Halloween outfit. 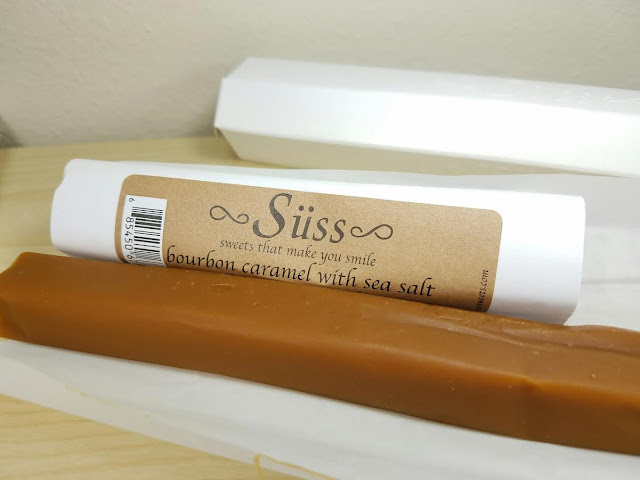 Suss Caramels Bourbon Caramel Bar- Okay. Let me just say this one thing. Try this at your own risk. Addiction is real. I decided to take one bite. That one bite became three which became an order on their website. I ordered right before we left and the box with the new flavors is sitting right over there in the corner. I haven't opened it yet because I might not be able to stop. This caramel is perfection, just the right amount of squish with a flavor to die for. Make sure you check out their website for some of the most irresistible flavors ever. VERDICT: I love everything so much it's hard to pick a favorite. Maybe the Suss Caramels because I actually bought more? But the Apple Jack tea is going to go fast, too, especially because it means I have an excuse to use the Manuka Honey I bought in New Zealand. The polish is gorgeous, the candle... That candle is to die for. I'm going to light it the second I finish up this review. (I'd have done it sooner but I couldn't remember where I'd stashed my matches). In other words, I love everything about this box and I cannot wait to see where the curator takes us for their next boxes. 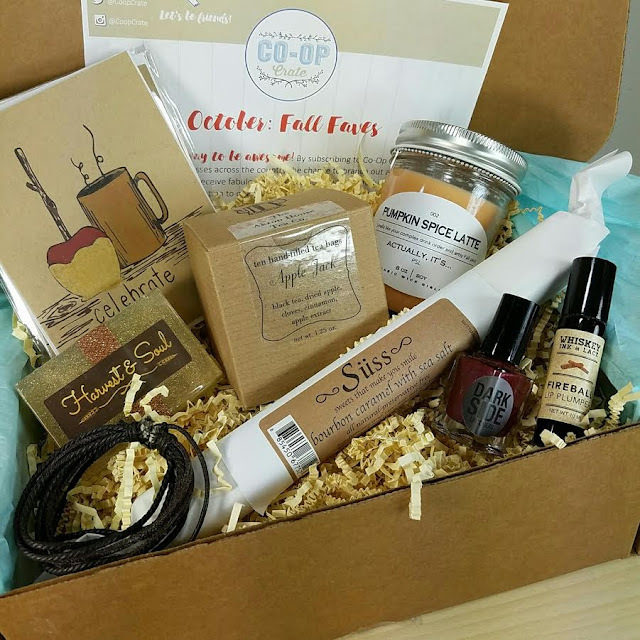 For the price of a specialty box like this, the value is excellent at about $70. I have to make sure to mention that I think this would make a SUPERB gift! I can't think of any woman who wouldn't want this box. Give it to your boss, your girlfriend, your mother and there's no way they won't enjoy it. Tis the season! If you would like to sign up for Co-Op Crate, you can do that here. Make sure to use code BITSANDBOXES10 for 10% off! 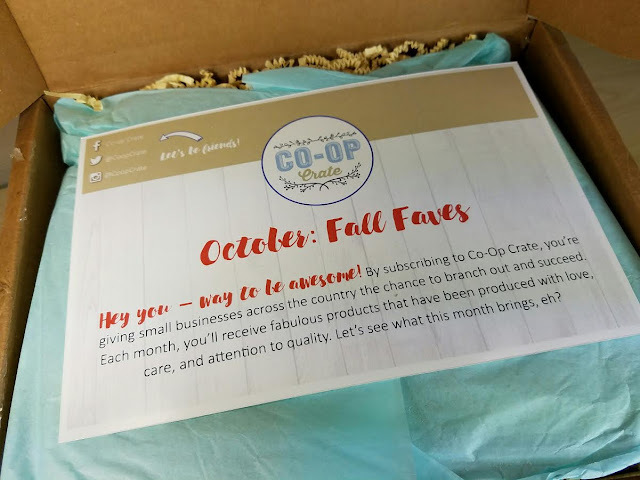 You can get this October box as a one time purchase if you wish and they also have a Mini box for $19.99. There is a wee bit of product variation but everything included is fantastic. You can find them in the shop. What do you think of Co-Op Crate? Any type of item you would like to see included? *This box was sent complimentary for review purposes. All opinions are unapologetically mine! affiliate links were used in this post. WOW. I've been checking your blog for new posts for some time.. decided you were in Kiwiland, hopefully having a blast without any mud- covered mountains. The Bourbon caramel bar is wickedly calling my dieting self's name. You say they have other versions? Must have a look. No mud covered mountains this time! Just rolling green hills with sheep. The Bourbon Caramel is tasty but my favorite is the Gingerbread and the Apple Cinnamon... Sooo gooood!